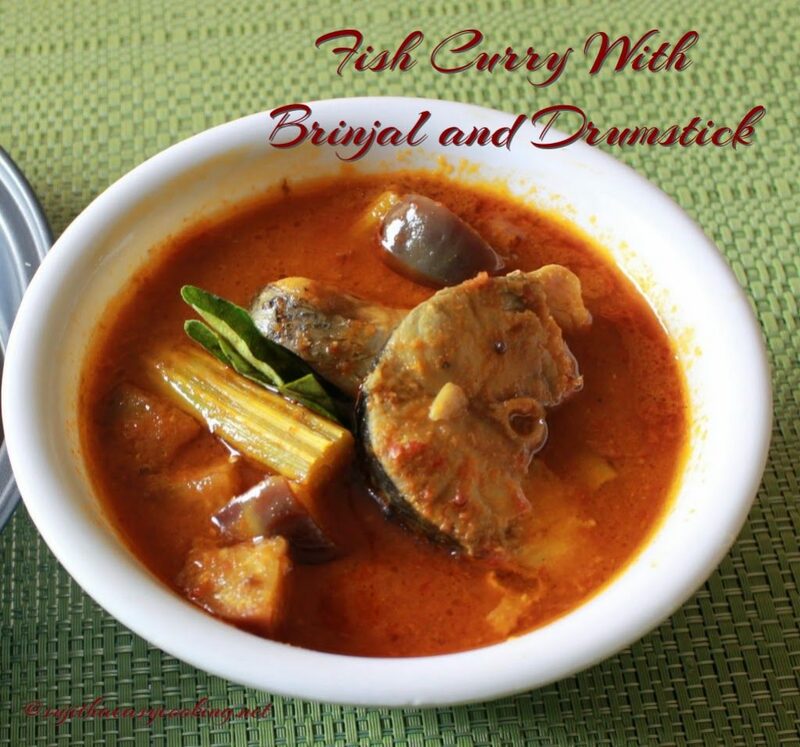 Fish curry with Brinjal and drumstick.. this is my grandma’s recipe.. she do it with country vegetable what ever she like, she’ll not use coconut or coconut milk to this curry..
As you all know making a curry without coconut is a bit challenging for me.. It’s a easy recipe with tickling taste.. my native is close to a coastal area, so mom prepare lot of fish recipes with different preparation.. 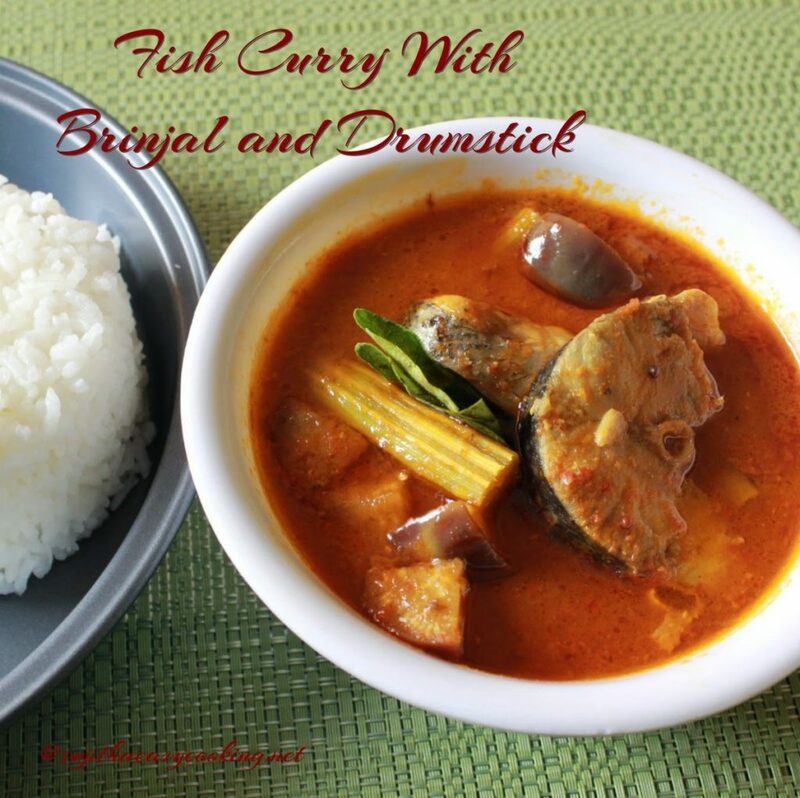 Lot of preparation in fish bengali, Kerala srilankan, Goan They have list of menu for fish recipes.. this tangy spicy curry is not like a regular one.. Lets see the Recipe first..
1. Take Tomato, Onion, Ginger, Garlic in a mixer and grind it to a smooth paste.. Heat the Kadai with Coconut Oil temper with Mustard, Fenugreek seeds and Curry Leaves..
2. Add the grinded paste to the kadai, cover and cook this for 10 mins to till the oil ooze out.. then add the Brinjal and Drumstick to the Kadai..
3. Mix them well and cook this for 5 mins in medium flame.. Add the Chilli Powder, Coriander Powder, Turmeric Powder to it..
4. Mix them well and sauté this for 2-3 mins till the raw smell goes… then add tamarind water and salt to it..
5. Once they get Boiled Add the Cleaned fish to it and cook it for 15-20 mins in medium flame or till the fish done.. I used sheela fish here..